This burro is packing in supplies for the Colorado Mountain Club's 1916 Wild Basin Outing. CMC Archives. In the annals of mountaineering history, there is little written about the beasts of burden, as pack animals are called: horses, mules, burros, oxen, yaks, and dogs. This blog post is dedicated to those animals that hauled climbers' gear, food, tents, and other equipment needed to explore and climb mountains. These beasts of burden provided early adventurers the opportunity to get deeper into the wilderness at a time when roads did not exist. Many of them have been captured on film in our archives. 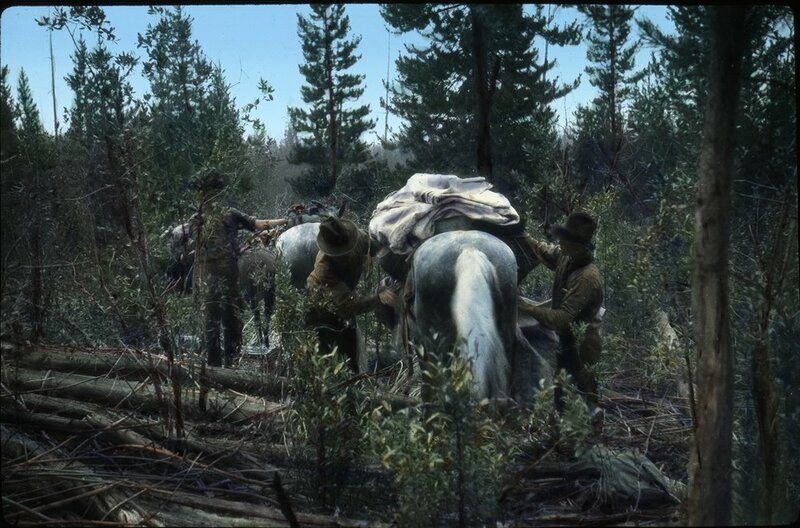 They are carrying or pulling men, women, children, boxes, bags, lumber for tent poles, wagons and sleds. Below are some lantern slides from the preparations for the June 1925 first ascent of Mount Logan, highest mountain in Canada. Albert MacCarthy used dogsleds and horses on snowshoes in February 1925 (three months in advance of the climbing party) to get a cache of supplies from McCarthy, Alaska, to a location along the way. Click here to read the account in the 1925 Canadian Alpine Journal. Somewhere between McCarthy, Alaska, and Mount Logan. Photo by Albert H. MacCarthy. This is a horse snowshoe found in the Klondike by Bob Bates. There would have been another strap to hold the horse’s hoof. An advance party beginning in McCarthy, Alaska, to cache supplies on the way to Mount Logan, February 1925. Photo by Albert H. MacCarthy. These photos are from the same February 1925 trip but with dogsleds. A hand-colored slide of a dogsled team in February 1925, heading out of McCarthy, Alaska, to cache supplies on the way to Mount Logan. Expedition leader Albert MacCarthy made this trip prior to the May departure date of the entire Mount Logan Expedition team. Albert H. MacCarthy Lantern Slide Collection. A dogsled team headed to a midway point to cache supplies for the 1925 Mount Logan Expedition. Albert H. MacCarthy Collection. 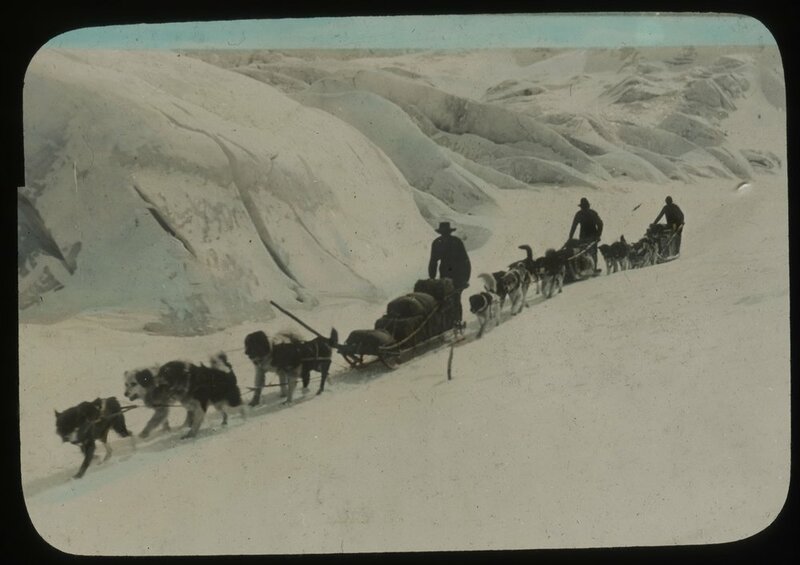 A hand-colored slide of a dogsled team headed to a midway point to cache supplies for the 1925 Mount Logan Expedition. Albert H. MacCarthy Collection. Horses, mules and burros were often used in expeditions and outings in the West. 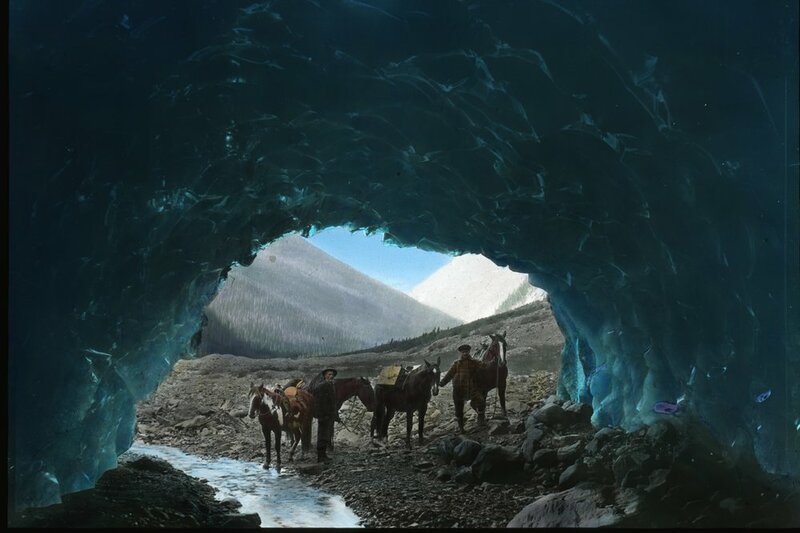 There are a large number of lantern slides in the AAC Library's collection that show these animals carrying all the materials for base camp. This includes large poles for mess tents that were so common in the outings of the Colorado Mountain Club. “S.E.S. Allen on horse,” ca. 1890-1920. AAC Lantern Slide Collection. Camp of the Snowmass Lake CMC Outing in 1933. CMC Archives. “Making Camp and Packing In” from the Snowmass Lake Outing 1945 album. CMC Archives. 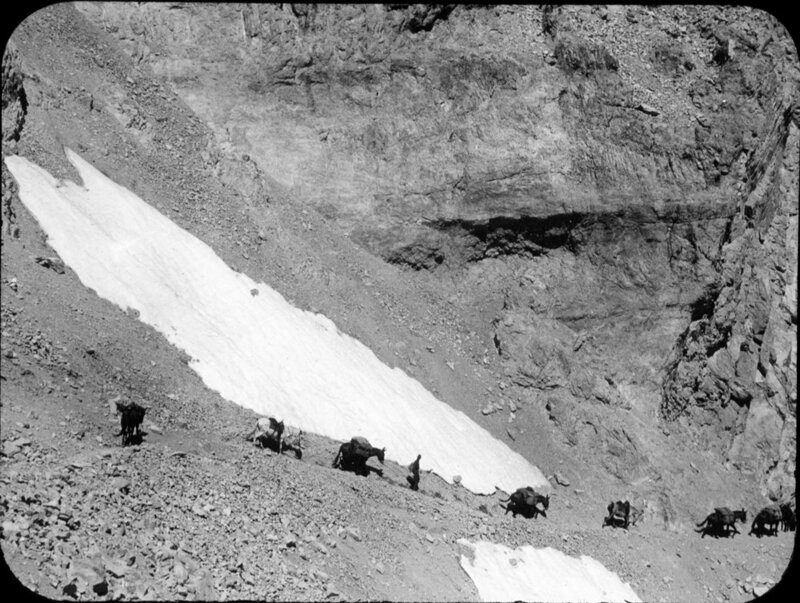 “Lightning Express.” These burros are pulling a carriage and supplies to the Colorado Mountain Club’s base camp in Wild Basin. CMC Archives. Another photo from the CMC’s Wild Basin Outing in 1916. This is presumably a group of camp attendees heading out to fish. CMC Archives. Also from the CMC’s Wild Basin Outing in 1916, this photo shows a boy riding a burro in camp. CMC Archives. 1916 Wild Basin Outing. CMC Archives. Snowmass Outing, 1922? [TBD - must check again, this was mislabeled Wild Basin which is nowhere near Taylor Pass in Gunnison Co., Colorado] CMC Archives. No caption or label. Likely in the area near Mt. Geikie in British Columbia on a trip with Allen Carpe. Helpfully labelled as “unidentified.” Likely in the Canadian Rockies by Andrew J. Gilmour, 1914 or 1916. Only labeled as “1920?” and possibly from the first ascent of Magog by MacCarthy, Wakefield, Waterman, Gilmour. Label reads: “[?] Valley [?] north to Saskatchewan basin, 1923.” Likely by J. Monroe Thorington . No label. Canadian Rockies likely. No label. This view is one reason to pack into the wilderness. Likely Canadian Rockies - Selkirks? Or, getting up the mountain is entirely up to you!